Billionaire Mikhail Prokhorov announced at a weekend congress of his new Civic Platform party that he is quitting business to enter politics full time, and delegates overwhelmingly elected him as their leader. Prokhorov, 47, said he would place his fortune, estimated at $13.2 billion by Forbes magazine, in a trust fund and allow his investment vehicle, Onexim Group, to oversee his assets in media, mining, financial services and other areas. Saying he would finance up to 10 percent of the party’s budget, he insisted that this time he would break into the political big time after two failed attempts. “We are not only a country with a great past but we have to become a country with a great future,” Prokhorov said while images of Russian poverty and despair appeared on a screen behind him. Prokhorov, who moved about the stage more like a university professor than a politician, received some of the loudest applause when he promised to regulate immigration to give preferences to highly skilled foreigners wishing to integrate into Russian society. “Russia is not a revolving door,” he said to clapping from a packed hall of opposition activists, leading intelligentsia, businesspeople, government officials and decorated military veterans. The first congress of Civic Platform took place in the same Russian Academy of Science building where Prokhorov held a conference of supporters as he sought to cling to the leadership of the Right Cause party last year. That short-lived foray into national politics, Prokhorov’s first, ended after the conference with him resigning under what he called pressure from Vladislav Surkov, then a Kremlin deputy chief of staff. “It was here that I crossed the Rubicon and declined to play by Kremlin rules,” he said. Prokhorov also ran for president as an independent candidate in March, placing a distant third with 8 percent of the vote. Vladimir Putin won with 64 percent, while Communist leader Gennady Zyuganov came in second with 17 percent. Prokhorov declared at the beginning of his political life last year that he wanted Putin’s job, which was prime minister at the time. But he avoided any direct attacks on Putin on Saturday, even as he repeated many of his presidential campaign promises to decentralize power and dismantle the Kremlin’s power vertical. He also proposed abolishing ethnicity-based republics like Dagestan, Tatarstan and North Ossetia and reducing the number of regions from 83 to just 15. He said ethnic groups could be assigned autonomous districts within larger regions, a practice of tsarist-era Russia. “If today’s Russia consisted of 15 regions, the bureaucrats would not be able to impose their will,” he said. Many of the 110 delegates from 51 regions who attended the congress praised Prokhorov’s proposals as a way to strengthen Russia. But the deputy head of the administration of Bashkortostan, an ethnic republic, complained that Prokhorov was overreaching with his ambitions. “It is not Prokhorov who created nationalities and federalism, and it is not he who should abolish them,” Abbas Gallyamov told Interfax from Ufa. Prokhorov’s reappearance in the national spotlight comes after months of silence following his presidential run, raising questions about his political intentions. Analysts have speculated that the Kremlin wants to use him and his party to reach out to the middle class, which is fueling anti-Kremlin protests in Moscow and other large cities. While the anti-Kremlin opposition appears to have largely lost trust in his leadership, Prokhorov was surrounded by a bevy of high-profile supporters at the congress, including his older sister, Irina Prokhorova, a publisher who also runs the Mikhail Prokhorov Fund on arts and culture, pop diva Alla Pugachyova, anti-drug activist Yevgeny Roizman and the newly elected opposition-minded mayor of Yaroslavl, Yevgeny Urlashov. Prokhorov first declared his intention to leave business for politics during a visit to Yaroslavl on Oct. 9. Also at the congress were opposition politician Vladimir Ryzhkov; Alexander Pochinok, a labor minister during Putin’s first term; and the government’s envoy to the supreme, constitutional and arbitration courts, Mikhail Barshchevsky, who laid out a plan to reform the country’s court system by allowing only former lawyers or prosecutors to become judges. “Then we will be able to get away from the judges who received a law degree from some textile institute,” Barshchevsky said. Former Finance Minister Alexei Kudrin, who regularly discusses strategy with opposition activists, sent his greetings to the congress. Igor Yurgens, head of the Institute of Contemporary Development think tank, said from the stage that Kudrin was not able to attend because of a previously scheduled meeting abroad. Liberal-leaning Kirov Governor Nikita Belykh said in an interview that he had come to the congress as an observer. “Some of those ideas sound like they are in tune with my own,” Belykh said. Sergei Militsky, a decorated colonel who retired from an anti-terrorism unit in the Federal Security Service a few months ago, said he liked Prokhorov’s patriotic statements and preferred Civic Front over the ruling United Russia party. “I don’t want to be part of the crowd,” said Militsky, who sat next to Prokhorov. Prokhorov said at a news conference after the congress that United Russia members in several regions have asked to join his party. Unlike Right Cause, a pro-business party created with the Kremlin’s blessing, Civic Platform has a loose structure that Prokhorov said is open to supporters with various views, hard-line nationalists being the exception. He said he would seek dialogue with all political forces, including the Kremlin and the anti-Kremlin opposition’s newly elected Coordination Council. “The party will be a platform where agreements can be reached,” he said. The party will also field candidates in Moscow’s mayoral election in 2014 — a post Prokhorov is expected to seek — and in the next presidential vote in 2018, said senior Civic Platform official Konstantin Doroshok, known for organizing rallies in Kaliningrad that ousted Governor Georgy Boos in 2010. 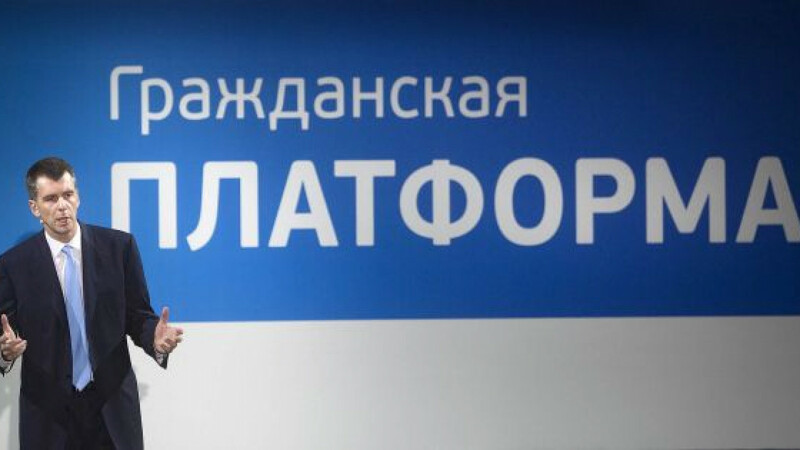 “The Civic Platform party will soon be setting the course for all of Russia,” Doroshok said in his congress speech. Political analyst Nikolai Zlobin compared the loose structure of Prokhorov’s party with that of the People’s Front, a loose structure of public groups and small parties chaired by Putin. “Prokhorov is strong in creative ideas,” Zlobin said in an interview on the sidelines of the congress. Zlobin, who attended as an observer, predicted that Prokhorov would seek support from within the Kremlin elite if his party was successful. “He wants to build something outside the Kremlin but later give it to the Kremlin,” he said. Prokhorov has denied that his party was created with the Kremlin’s blessing. Some analysts believe, though, that Prokhorov and his party might be used by a group within the Kremlin to battle for the presidency after Putin’s term ends in 2018. Former Kremlin insider Gleb Pavlovsky, who attended the congress, told Novaya Gazeta newspaper earlier in the week that a “premium class” of business leaders, governors and senior bureaucrats might try to conspire against Putin for fear of their own fates at the end of his presidency.